First, let me state up front, I am an independent product tester and journalist and received no compensation from the manufacturer for this review. When I first met Dave Sandel, the inventor of Love Jugs and CEO Steve West at the V-Twin Expo in Cincinnati, I must say I was not convinced that they had "fixed" the problem of "Hot Harleys". I was so reluctant that I asked to move the interview to the last 2 hours of the last day if the show. I knew that by then most everyone would have left to head back home and most exhibitors would be packing up to move to the next show. So with no pressure from crowds and other manufacturers, we came back two hours before the show was to end. To my surprise there was Dave Sandel and Steve West smiling and waiting for us. I thought to myself these guys are nuts. Didn't they know I was going to rip their product apart with questions about the truth of their claim and the reliability of this toy? You could tell they wanted to meet this challenge head on and they were armed to answer every question to my complete satisfaction. Before the first question, Dave Sandel, Inventor of the LOVE JUGS boasted "Hot Harley? - Problem solved!" He continued, "Our systems are guaranteed to keep your oil flowing and your engine running significantly cooler, and that is guaranteed to make your ride cooler too." A bit of history may help explain my hesitation to such a bold claim. The first Harley I rode any distance on was a 1965 Electra Glide. This “Blue Angel” was the coolest looking bike on the road at the time. However it was anything but cool riding this demon in south Texas in August. Since that time I have tried so many devices and gadgets. I can't count the amount of money, time and effort I have spent trying to find something to cool down my Harley’s. Lately I have been told that the “Parade Fan” is the way to go in cooling and keeping the heat off my bike. WRONG! Then came the “Lenale Fan” with its promises. This was a waste, the reason being that the mounting brackets were bolted to back of the single (as in one) Lenale fan. I’m a biker not a engineer however even I know that any fan can not work if you cover the airflow the fan is expected to put out. So here we are today still struggling with this same problem of “HEAT”. I love my Harley; I don’t want a BMW, Honda or etc. I want to ride my Harley even if it’s in the high 90’s in Texas and not have to wait until the sun goes down to go riding. So now I put on our test Bike the sleek new LOVE JUGS COOL-MASTER. And took off for a 2,068 mile test ride. Down though the Daniel Boone National Forest, the Great Smoky Mountains, the easy flowing traffic of Atlanta (joke) where during rush hour traffic or construction you can go at 10-15 MPH for very short distances at a time. From Atlanta I was off to Salem and Montgomery, AL. Then it was some open Interstate to run all the way to Vicksburg, MS, then its time to get off the fast track & do some back road riding up to Yazoo City where I saw a sign that said fresh donuts and coffee, and I thought to myself I know a great place for that. 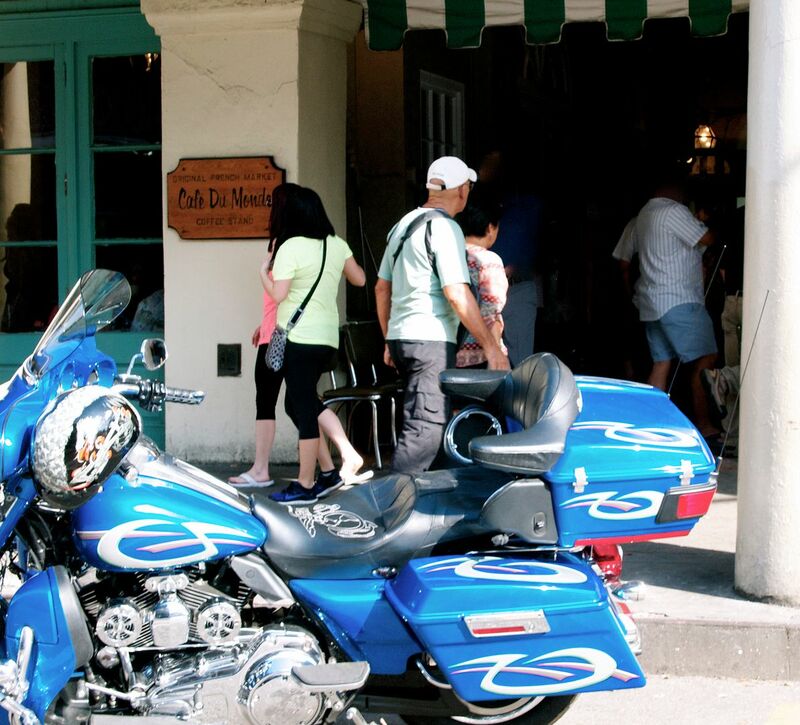 So I headed to the French Quarter to Café Du Monde, New Orleans, LA, for some Beignets & Chicory Coffee. So after I had my fill I headed back to Birmingham, AL, and Nashville, TN to Cincinnati, OH. My LOVE JUGS fans withstood the harshest conditions I endured. LOVE JUGS are 100% waterproof outdoor rated fan motors, and my trip confirmed that! If it was not raining it was as hot as Hades. The original model produces more than twice the cooling power of its closest competitor – while the new model packs even more punch. The more air, the more comfort for the rider and the more protection for your engine. This no nonsense sleek face gives the unit a finished custom look that is as at-home on a $100,000 custom bagger as it is on a 25-year-old Electra Glide. They will actually run while submerged underwater as can be seen on their website. http://love-jugs.com/videos/. Luckily I didn’t have to ride submersed under water! Believe it or not, some competing systems use indoor rated fans, which will short out when exposed to water – even during a washing. And yes… I do LOVE JUGS! I have had two Harley Techs tell me because of the addition of the LOVE JUGS & an oil cooling system I have possibly extended the life of the most expensive part of my Harley-the motor about 50,000 miles. To me that is the best endorsement of a product I have ever given. And that is a great insurance policy and peace of mind for me. For more information, take a tour of the web site: www.love-jugs.com or contact: Hammerhead Engineering CEO Steve West at steve@love-jugs.com or call him directly at (561)499-0974. He’ll be happy to speak with you. Two Wheel Thunder TV, LLC. "Certified Disabled Veteran Owned Business"
Our motto: "In God We Trust"
I installed the love jugs on my '15 TG last fall when I returned from Daytona. I had a single fan on my '11 TG and it worked but wanted something more powerful. I was planning a test this spring but ran into medical problems. Open heart surgery in March to replace a valve. Needless to say I haven't been on the bike this year. The only thing I didn't care for was the original mounting bracket which allowed for a good bit of vibration. I opted instead to upgrade to the optional heavy duty 'Vibration Master' mounting system and have been very happy with it. Very easy to install with complete instructions. I'll let you know of the performance once I get riding again. I also installed a digital oil heat gauge to help. I installed the heat-master series, love-jugs on my 97 FLHTCUI, with a Motor-Trike kit on it. As a Shriner riding in parades before the Love-Jugs, it would damn near cook the engine. After installation the rear cylinder temp dropped a 100 degrees. Living in Northeast Louisiana, we have some extremely brutal heat in July and August. When everybody else is worried about their ride overheating. I'm still riding 2 up. Fists in the wind. Knees in the breeze. Great review and as Skuuter said, its nice to hear from real life usage. I installed my first set of Love Jugs on my 2012 Road Glide early last year, I put them to the test riding from NC to Santa Fe, NM via hwy 82 across Texas in early July with 100+ temps all the way. I recently purchased a 2012 tri glide for my wife and one of the first modifications was to install a set of Love Jugs on it. These work great, look good and remove the worry of over heating no matter how long it sits at idle. Well worth the money and easy to install at home. Wayne, welcome to Trike Talk from West Virginia. First thing, are you sure it is a Lehman Trike ?? Welcome aboard wayne. Hopefully our resident Lehman expert "JIM" will be along shortly to help out if possible. Looking for wise council from y'all in regards to replacing my rear shocks. Frank, I'm sure you have spoken to your trike builder about this problem, what did they have to say about it? What do you like about your Lehman Trike? Just saw that I posted in this thread half way back …. my bad.